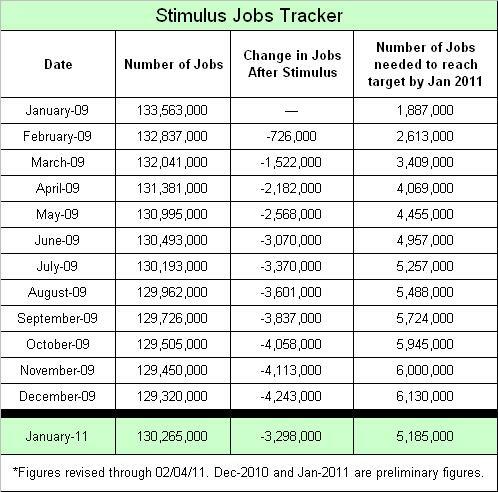 Obama’s economic stimulus bill was sold to us with the promise of creating 3.5 million jobs by January of 2011. Well, since January has now passed, it’s time to tally up the results. My previous post, Tracking the 5.2 Million Jobs Obama Squandered, was about dead on. You can call it 5.19 million jobs squandered if you like, but it’s still 5.2 million when rounded off. For a refresher, “Tracking the 3.5 million jobs Obama will save or create” was the title of a blog post, last updated on January 8, 2010, on a website named Understanding The Market – Capire Il Mercato. In a note, the author, Cole Kendall stated, “I will make the calculations in a way that provides a “best case” to the Obama team.” Since Mr. Kendall decided to give up on his tracking operation at the end of 2009, I decided to follow it through to it’s dire conclusion. Using the same criteria as originally outlined by Obama’s (now former) economic team, jobs are defined by counting the total non-farm employment, from Table B-1 of the Bureau of Labor Statistics, “Employment Situation Report” (as seasonally adjusted). Instead of boring you with the month-by-month data, I went ahead and cut to the chase, skipping from December of 2009, where Mr. Kendall left off, to January of 2011, up to the latest data available from the 02/04/2011 jobs report. This post will track the 3.5 million jobs. There are a number of ways to measure jobs in the US. Some people work several different jobs at a time while others change employers frequently, so measuring jobs is not as simple as it might seem. There was a cartoon from the Clinton era showing the President speaking at a dinner that he had created 8 million jobs and an overworked waiter thinking that he had three of them. Obama’s economic team defined jobs [as those contained in the Department of Labor’s establishment payroll data] (see here for their original report). The conclusion is pretty grim, and certainly doesn’t mesh with what Obama has been saying out on the campaign trail. The sad truth is that instead of creating 3.5 million jobs, since it was passed, the stimulus plan has instead resulted in the loss of 3.3 million jobs. 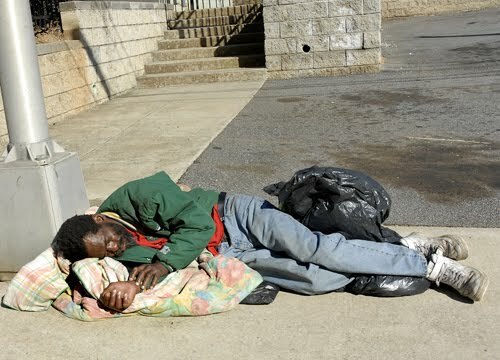 Since the stimulus plan was supposed to have saved 1,613,000 jobs, in addition to creating 1,887,000 jobs, by January of 2011, and since it has actually resulted in the loss of 3,298,000 jobs, Obama’s Economic Stimulus has fallen short of the original target by 5,185,000 jobs. I don’t know what you call this, but I call it a colossal failure. Perhaps it’s time for an orderly transfer of power? Do we need another stimulus plan, or just another President? I don’t think Obama is helping his case by roaming around the country making false claims in what appears to be a frantic effort to get re-elected, especially when he’s the one who screwed this up. The thought of trillions in deficit-financed spending flushed down the drain, to no avail, doesn’t bode well for Democrats, nor for Mr. Obama. Thanks so much for such a detailed analysis. I hope it gets a lot of attention, especially after all the media hype over this.